Stephen Hawking's Ph.D. Thesis Crashes Cambridge Site After It's Posted Online : The Two-Way By late Monday, the thesis had been viewed more than 60,000 times, a Cambridge official says. He adds, "Other popular theses might have 100 views per month." The acknowledgements page of Stephen Hawking's doctoral thesis includes his certification that the paper is his own work. 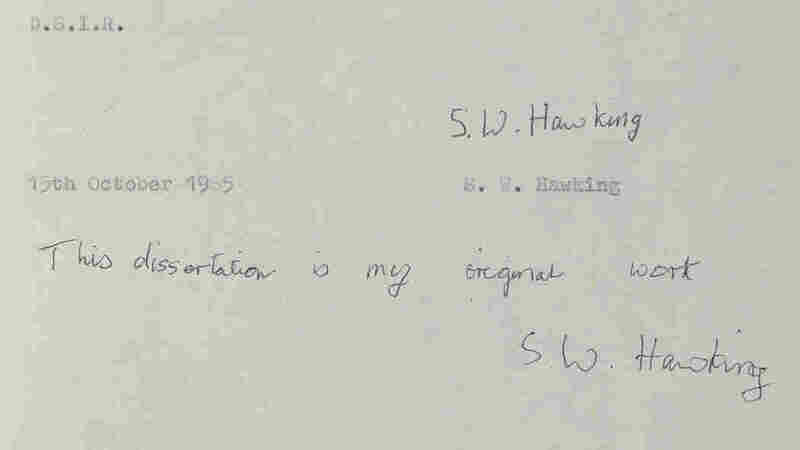 Hawking submitted the thesis in October 1965, when he was 23 years old. Two years earlier, he had been diagnosed with amyotrophic lateral sclerosis (ALS) — the motor-neuron disease that doctors predicted would kill him within a few years. Fans of the professor who wrote A Brief History of Time will no doubt understand that there is little point in becoming frustrated over a one-day slowdown on a Web server. 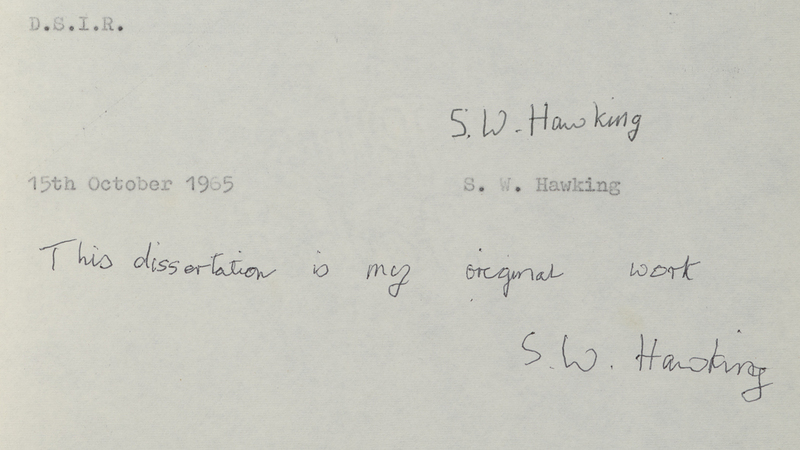 In the meantime, we can offer a glimpse into what Hawking wrote. "The idea that the universe is expanding is of recent origin. All the early cosmologies were essentially stationary and even Einstein whose theory of relativity is the basis for almost all modern developments in cosmology, found it natural to suggest a static model of the universe. However there is a very grave difficulty associated with a static model such as Einstein's which is supposed to have existed for an infinite time. For, if the stars had been radiating energy at their present rates for an infinite time, they would have needed an infinite supply of energy. Further, the flux of radiation now would be infinite. Alternatively, if they had only a limited supply of energy, the whole universe would by now have reached thermal equilibrium which is certainly not the case. This difficulty was noticed by Olders who however was not able to suggest any solution. The discovery of the recession of the nebulae by Hubble led to the abandonment of static models in favour of ones which were expanding." The thesis consists of four chapters: "The Hoyle-Narliker theory of gravitation," "Perturbations," "Gravitational radiation in an expanding universe" and "Singularities." "Some implications and consequences of the expansion of the universe are examined. In Chapter 1 it is shown that this expansion creates grave difficulties for the Hoyle-Narlikar theory of gravitation. Chapter 2 deals with perturbations of an expanding homogeneous and isotropic universe. The conclusion is reached that galaxies cannot be formed as a result of the growth of perturbations that were initially small. The propagation and absorption of gravitational radiation is also investigated in this approximation. In Chapter 3 gravitational radiation in an expanding universe is examined by a method of asymptotic expansions. The 'peeling off' behaviour and the asymptotic group are derived. Chapter 4 deals with the occurrence of singularities in cosmological models. It is shown that a singularity is inevitable provided that certain very general conditions are satisfied." The thesis was approved in February 1966. 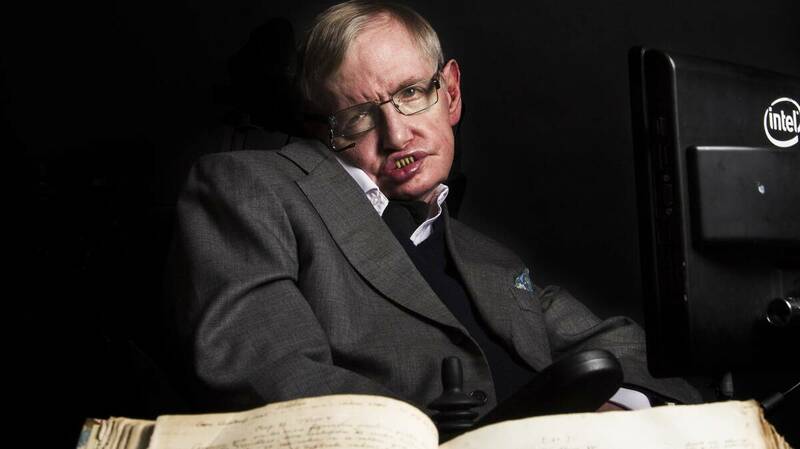 In its citation, Cambridge has added a line stating, "This thesis has been made openly available with the kind permission of Professor Stephen Hawking."